Use of cell phones or other electronic devices while driving is dangerous and can cause fatal car accidents. Most drivers know this but they still use their cell phones or other mobile devices to text, look at travel directions, check their emails, consult their calendar appointments, surf the web or play video games. 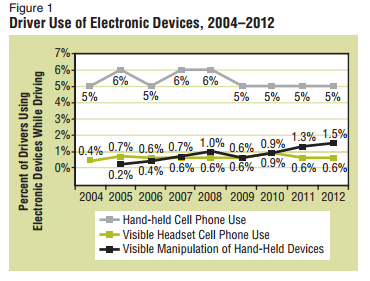 According to the latest National Occupant Protection Use Survey (NOPUS) “Driver Electronic Device Use in 2011“, texting or manipulating an hand held device while driving significantly increased from 2010 to 2011. The trend is particularly alarming among young drivers and women.